Heavy scarification is a benefit, as is aerating and spiking, to prepare the lawn for overseeding. 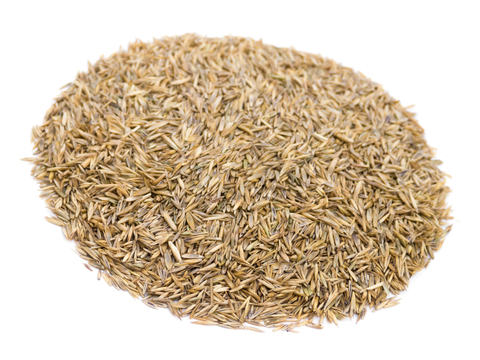 By overseeding we simply mean the application of grass seed to the lawn to root between the existing grass. You may say, well the grass grows back to fill in patchy areas. Sideways growth is not always good for the lawn and it encourages more dominant grass to take a hold. By overseeding you are promoting a more even lawn in terms of growth and colour, filling bare patches with vigorous new growth and ensuring a thicker, more uniform lawn. The best way to spread the seed, which you can bulk buy through your garden centre or online, is to use a spreader. This could be one you buy, hire or attach to your garden tractor for large areas. This way you will have control over the spreading rate. Broadcast the seed on a dry day when there is no breeze or seed can drift into borders. Work in two directions, like striping the lawn, so you don’t miss any areas. You can rake the seed in or rake/harrow over large areas using your ride-on. Then it’s good to apply a top dressing to aid the seed growth and help protect it from the birds.